Are you looking for a new, high-quality kayak, but you don’t know where to start your research? Well, you’re in the right place. Our Intex Explorer K2 Kayak Review is the perfect reading material for you. The Explorer K2 is, without a doubt, one of the bestsellers in its category. If you are an entry-level kayaker on a budget, this recreational kayak is the perfect model for you. Here is a quick recap on what we think of this kayak. Intex is one of the largest manufacturers of inflatable products. It operates in more than 100 countries, and it has been on the market since the ‘70s. It mainly focuses on high-quality products at an affordable price, with safety, comfort, and fun in mind. But, let’s not get ahead of ourselves just yet. We’ve got a great review for you, so keep reading to find out whether we think this inflatable kayak is worth the money. Intex Explorer K2 Kayak - Is it Safe Enough? Before we start describing how you can use this kayak, it’s vital to mention its dimensions. After all, you still have to find enough storage space for it. This kayak is 10ft 3in long. The width of it is also quite convenient - 3ft in total. Therefore, this kayak is perfect for two people who don’t necessarily weigh a lot. 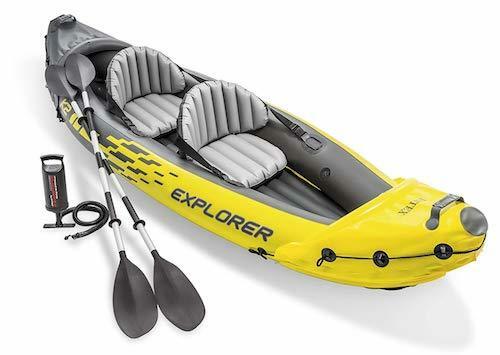 The Intex Explorer K2 Kayak weight limit is about 400 lbs. No matter how perfect your life is, you have probably imagined yourself somewhere far from big cities, cars, and crowds. Yet, whenever you have time for a vacation, it’s just easier to pick a beachy getaway instead of an active holiday. Yes, beaches are great. But, kayaking can be therapeutic, and if you have the right equipment, it can also lead to an incredible adventure. Just imagine it - nature, clear skies, and the calmness of the river. It doesn’t get any better than that, does it? And that’s what people behind the Explorer K2 kayak had in mind. They wanted to make it easy for you to say “No” to lazy holidays, and help you truly relax while having an active vacation. It's got value for money with everything you need for some quality family time. With its two seats and plenty of space to spare, it is still lightweight (31 lbs), which makes it perfect for traveling. Like we previously mentioned, the official weight limit is 400 lbs, so it can hold two adults without performance loss. But, the best part is the easy set-up. 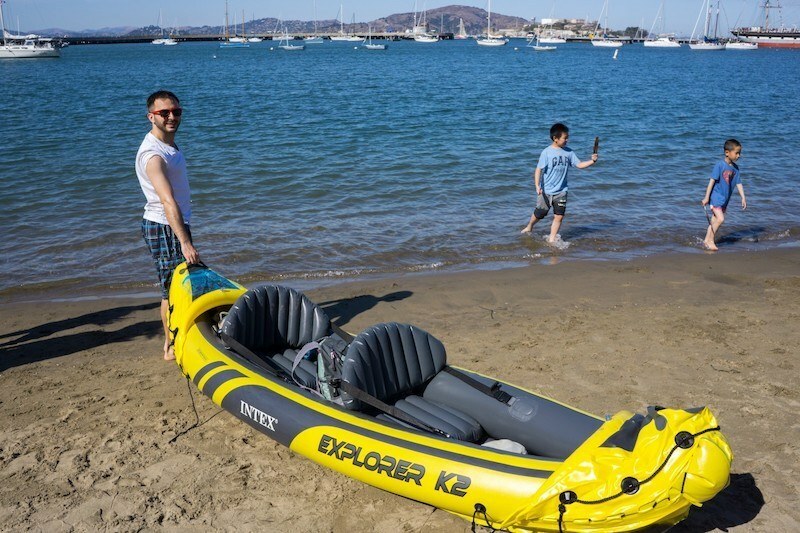 Even if you are a complete beginner, it takes only about 15 minutes to set it up from vehicle to water, and it can be quickly done by just one person. However, if you are not convinced that kayaking is for you, remember that having the right kayak makes all the difference. If you get the right equipment, nothing can stop you from enjoying nature and going on exciting adventures whenever you need to de-stress. But, I have no experience, I hear you say. I know nothing of kayaks, rivers or boats. Well, you’re in luck. 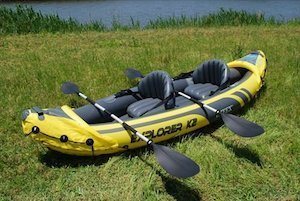 The Explorer K2 is made for easy paddling, and it is a snap to assemble. It’s not really a sports Kayak, to be honest. It’s comfortable, thanks to adjustable seats and backrests, and it’s easy to take it with you, thanks to the magic of inflatable material. It even comes with a highly efficient pump that you can use to inflate and deflate the kayak. The package also includes bow and stern covers, oars, seats, and a repair kit. The streamlined design makes the paddling easy, even if you are a beginner. When the featured skeg is in place, it’s relatively easy to maneuver and control the Explorer K2. The included skeg really makes a difference here, even at full weight capacity. And if you are paddling in a straight line, the speed improves dramatically. Oh and by the way, the skeg has a bad habit of getting lost. But, you can quickly resolve this by securing it to the kayak, thus making sure that steering stays easy and simple. It’s actually designed to be your first kayak - the one you will use for your first kayaking adventures. But, more advanced kayakers will probably think that this model is a bit basic. Nevertheless, if you've just discovered all the benefits of kayaking, this is a fantastic entry-level watercraft. You should use this kayak in smaller bodies of water, such as lakes and peaceful rivers. However, it’s also built to withstand some severe conditions (not all of them, though). It’s made from heavy-duty puncture-resistant vinyl, and it has two separate air chambers with internal tubes, so you know you will be safe during your adventures. Moreover, re-entering is also easy, and it won’t flip over even if you board it in the middle of the lake after an unplanned dip. 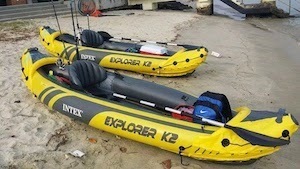 When it comes to visibility, the Intex Explorer K2 Kayak yellow black color scheme is the number 1 thing that will keep you safe while in the water. This color combination allows other boats to easily spot you, which is often a problem with kayaks. Because they are so close to the surface of the water, bigger boats can easily oversee them. The bright color scheme gives the Explorer K2 a US Coast approval, and that gives you some peace of mind. When you are far away from civilization, whether you are fishing or just paddling carelessly, one thing is a must - reliability. And, in the case of an inflatable kayak, reliability means durability. The Intex Explorer K2 Kayak can take a beating, even though you should use it in calm waters only. Testing the limits is, of course, not recommended, but in most cases, it will handle rocks, rough water, and hooks. Furthermore, it is surprisingly stable. While paddling through rapids, you might jump around in it, but chances of the kayak flipping over are very slim. Most importantly, Explorer K2 comes with two separate air chambers. That means that, even if something goes wrong, and one chamber gets punctured, you know you’ll be able to get back to the shore safely. Probably the best thing about this kayak is the price. You’ll be hard-pressed to find such quality and attention to details for just around a hundred bucks. And, if you are new to the game of kayaking, you probably aren’t willing to spend upwards of $600 for your first kayak. If you don’t plan to conquer whitewater rapids, the Explorer K2 is the best value for money you can get. Going on adventures with it is fun, safe, enjoyable - and incredibly cheap. It has a decent weight capacity, and you can use it for kayaking with your best friend or partner. The Boston valves allow for quick inflation and deflation, so you will not have to wait for hours until you can use it. The color scheme is fantastic. It's fantastic for beginners - and the quality-price ratio is incredible. It’s not a great kayak for rough conditions. Although it’s durable and sturdy, it’s not made for extreme weather. The paddles could be better. They are not adjustable, so you are stuck with 85”. That means it can be difficult for children to be of any help when it comes to manoeuvring. This is something we just couldn't leave out. 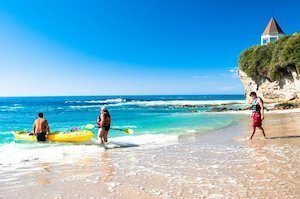 Because most inflatable kayaks focus solely on seating, they leave no extra room for any kind of equipment, or even food and water. Not this one, though. 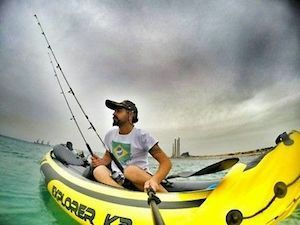 The Explorer K2 inflatable kayak is also perfect for fishing - it has enough space for your equipment and good enough stability for you to relax. Even with two people in it, it offers plenty of room in the back for any needed cargo or equipment. So, should you buy this kayak? Well, the shortest possible answer is - it depends. If you are looking for a kayak that will help you conquer rapids and strong currents, then it’s probably not for you. The K2 is a recreational inflatable kayak, made for family trips and quiet fishing adventures. It is not a professional, hard-shell, carbon fiber, slim water beast. On the other hand, if you are planning a fishing trip or a weekend getaway with your partner, the Explorer K2 is an excellent choice. The value it offers is almost impossible to beat, and you can be sure of its safety. It is reliable, sturdy and durable, with numerous fail-safes that guarantee fun without worries. It truly delivers in the areas it specializes in. Additionally, it’s simple to set up, and inflating and assembling it is a breeze - even for a complete beginner. So, if you are an amateur kayaker with equilibrium in mind, we can safely recommend this kayak. We hope that our Intex Explorer K2 Kayak Review has helped you recognise the qualities of this product. Although it’s not perfect, we give it a solid 4.5 out of 5. The price is right, and the kayak is ideal for weekends by the river - what more could you ask for?